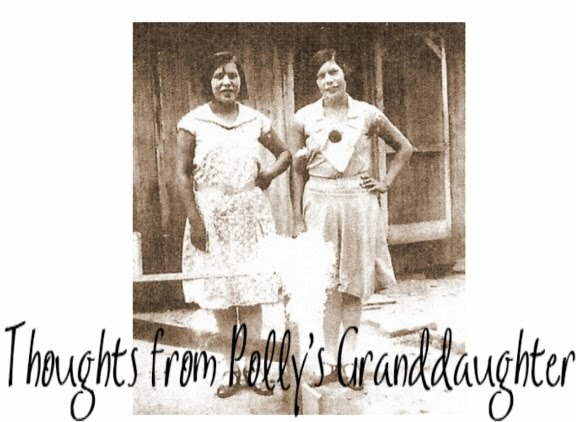 Thoughts from Polly's Granddaughter: Warren's Mother Listed As White on Death Certificate - How Much More Do People Need to See? Warren's Mother Listed As White on Death Certificate - How Much More Do People Need to See? How much more information do people need to see before they understand Elizabeth Warren's mother was not American Indian/Cherokee, as she claims, but instead white? Every time she opens her mouth to tell a new story about her Cherokee ancestry, we have provided information that brings a lot of reasonable doubt to that story. Her ancestors are always listed as white in the records and documentation. 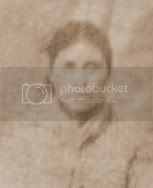 Her great grandaunt, American Isabel Crawford, was said to be white by her husband and then later her daughter said there was no Indian blood in that line. 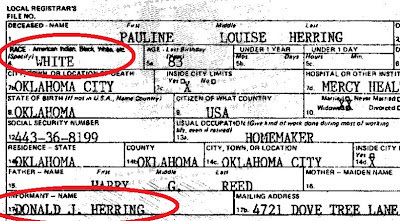 Her "Aunt Bea" who she claimed got cheated out of the "high cheekbones" was listed as white on her death certificate and the informant was Elizabeth Warren herself! 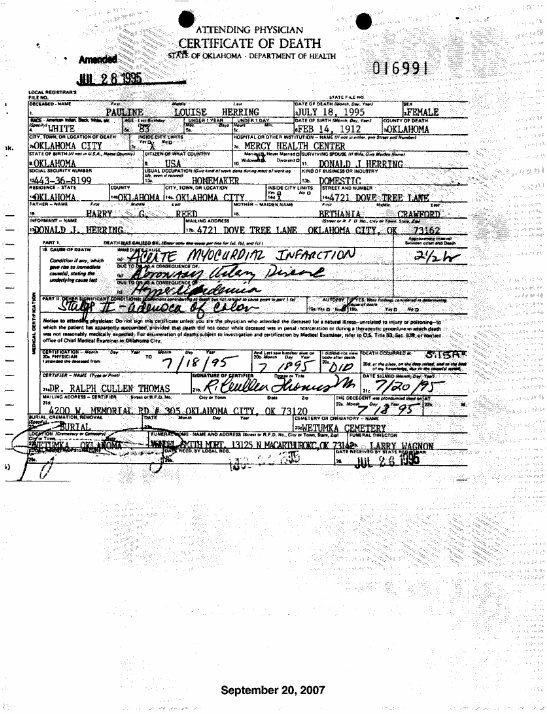 Now we have Warren's mother's death certificate. Remember her mother? Pauline Reed Herring. The one who was so Cherokee/Indian, she had to elope? Well, she is always listed as white too, even on the 1940 US Census and on her death certificate. 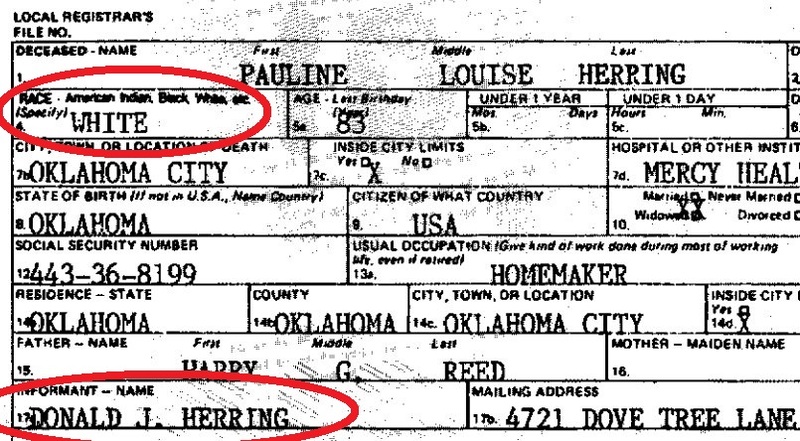 If this was such a part of their lives and how they lived and it caused them to be "between two families" like Warren claims, then why is Pauline listed as white on her death certificate and why is she always found in the records as white. Why did Warren's own father list his wife, Warren's mother, as white if being Indian was so important to her? Warren said she won't deny who her mother was, but she continues to do so every time she claims her mother was Indian. Clearly, Pauline was not Indian, but Warren won't give up the claim. I haven't figured out yet if Warren is a typical wannabe who just refuses to acknowledge the truth about her ancestry or if she is a pathological liar who thinks the American public is just too stupid to catch her in her lies. Whatever the reason, it is time for Elizabeth Warren to either pony up some documentation to show she is Cherokee or it is time for her to stop claiming it. It is a shame that her white family was not good enough for her so she had to cling to some mythological Cherokee family, casting them aside when they no longer benefited her, while now clinging to the white voters in MA and casting aside the Cherokee voter in MA who wanted to speak to her. The Cherokee people are not a pretty little accessory to be used when needed and then thrown away when we have served our purpose. Warren had a chance to end this by meeting with the Cherokees who went to Boston. She could have met with them, looked at the documentation, taken ownership of her misunderstanding of Cherokee citizenship and identity, and then led the charge on reforms in this area, but she chose not to do that. It would mean she had to give up her claim of being Cherokee and she can't find it in herself to do that. We can only hope that someone, somewhere in Washington DC, is watching this fiasco and sees what a serious issue false claims are and that they will eventually help bring about the changes that need to be made in the federal definition of Indian so that things like this never happen again.